(Hayden, ID) Alien Gear Holsters, the most comfortable and concealable holsters on the planet, now offers over 500 gun holster options to carriers. From the popular Glock 43 holster to the notorious 1911 holster, this Idaho-based company has grown from just 250 gun holsters to over 500 different handgun holster types in less than two years. Alien Gear Holsters has grown at a phenomenal rate because of the quality and affordability the company offers to the concealed carry community. Every custom molded holster shell is a part of a universal shell system. This allows anyone with an Alien Gear Holster to easily swap out their shell to match the gun they choose to carry. The universal shell system eliminates the need for you to buy a new holster for each gun you own. Instead, you can buy just one holster base capable of housing multiple shells and guns. Alien Gear Holsters’ shells are made from dense Boltaron, a material notorious for its strength and resilience to extreme temperatures. The handgun mold also covers more of the gun, which prevents your clothing from being torn. This design also protects your front sights from being damaged by movement. Alien Gear Holsters also produces concealed carry holsters for guns equipped with Viridian Green Lasers and Crimson Trace laser sights. The lasers will activate upon drawing your handgun and will deactivate when re-holstering your pistol. Every Alien Gear Holsters shell, available for just $12.88, can be swapped with our Free Shell Trades for Life Guarantee. This allows concealed carriers to send in their old shell in exchange for a new gun holster shell to match their current sidearm. Open and concealed carriers can swap out their shells an unlimited amount of times as long as they own an Alien Gear Holster. 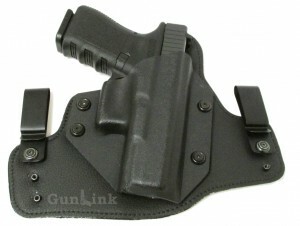 Check out the GunLink reviews of the original CloakTuck holsters as well as the CloakTuck 2.0 and accessories. Their latest offering is the all-new CloakTuck 3.0 holster. Share your experience with Alien Gear holsters in the comments section below or in the Gear Review section of the GunLink forums. Founded in 2013, Alien Gear Holsters manufactures premium, incredibly comfortable gun holsters for concealed carry. Alien Gear Holsters are the most comfortable concealed carry holsters on the planet. Any planet. For more information about Alien Gear Holsters, visit aliengearholsters.com.